There have been recent studies which show that special care babies thrive better if they are kept in the dark for certain periods. The only practical way of doing this is to place covers over the incubators, as these can be put on and taken off easily. Quilts for babies in Special Care Units at local hospitals has been an ongoing project for Norfolk Quilters. 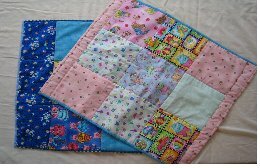 All quilts for babies have to be washable, but they do not have to be boilable. However, it is always wise to prewash certain colours for colourfastness; if in doubt, prewash all fabric used. Do not use buttons, ribbons, beads or any similar trim which would not be suitable. I recently had a meeting with the nurse in charge of the Special Care Baby Unit. When Norfolk Quilters first started making quilts for them they wanted tiny quilts 17″ x 21″ which then changed to 24″ x 18″ to go on top of the incubators. What they really need now is larger quilts about 3ft Square. They do still have some of our quilts which they use, but not enough and so they are using hospital towels to serve the purpose for most babies. They would much prefer to have lovely quilts which make the place look less clinical and more welcoming for the families. Can you make some 36″ Square quilts quickly? They would be grateful if you could. All projects can be handed to the Chairman at Norfolk Quilters’ events, or at the AGM in October. Delivery can be arranged by contacting Pat Lowe (email: tricialnq@aol.com – please make the subject Special Care Babies; Mob: 07930 917343).